There are a few key things to consider when designing a stylish, yet practical dining area that the whole family can enjoy. Today’s busy lifestyle has changed the way we use our home: a quick bite might be eaten at the kitchen counter and the dining table likely doubles as a place to work or study. The traditional dining room has largely disappeared in favour of an open space plan, which allows people to remain sociable – even if they are busy doing their own thing. However, even without a formal dining ‘room’, your dining area can be decorated in a way that makes it both functional and inviting for family and friends alike. The ideal dining table for your home requires a few considerations – the best size for your space, the style to match your decor and of course a surface suitable for everyday use. Round tables are good space savers and enhance the flow of conversation, while rectangular tables are a great fit in a large room and when you need to seat a few people. Resist the temptation to cram your table too close to the wall; try to keep at least 90cm clearance between the edge of the table and the wall behind to make it easy for people to get up and down from your table. 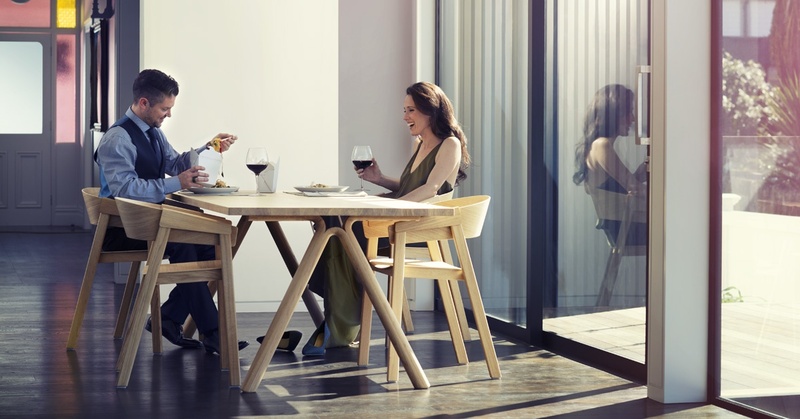 Download our guide for a more comprehensive overview to The Perfect Dining Table. The days of matching table and chair sets are long gone and there’s just one rule: chairs should enhance the space and complement the style of the table. Consider a bench seat for a casual look that can also save space, or look for dining chairs that suit your style. Always keep practicality in mind – upholstered chairs may look gorgeous but aren’t suitable with rambunctious toddlers, in which case wipe-clean acrylic would be a better pick. Go for chairs that are 45cm to 60cm deep and allow around 30cm of space between the top of the chair and the top of the table for comfort. If you really want material, check that it can be removed and washed when needed. Statement lighting above the dining table pulls the whole look together and creates ambiance. A quick tip is to mimic the shape of the table and keep the lighting in proportion with the table size. A cluster of lights look gorgeous above a round table, centre a long row of evenly spaced pendants above a rectangular table, or opt for a single, grand feature light above a square table. If you’re having more of one light stick to odd numbers - three or five looks far more impressive than two or four. Aim to leave around 90cm of space between the pendant and your tabletop so the lighting doesn’t overwhelm diners and install a dimmer switch so you can control the mood. Fresh flowers always make stunning table centrepieces, while crystalware and clusters of candles are classically elegant. Consider a group of items on a tray that can easily be put aside if you need the space. Just remember to keep things below eye level so your display doesn’t interrupt conversation. A contemporary table can happily break a few rules, so feel free to mix different dinnerware sets for a unique look that works with your home decor. Our "Guide to Choosing the Perfect Dining Table" is a quick read but full of important things to remember when you're ready to buy.